Description: Marcus Jones reports on the ordination of Reverend Barbara Harris as Bishop of the Episcopal Diocese of Massachusetts, which has been the focus of international attention and controversy. Press conference held by Harris and David Johnson. Harris says that she will seek understanding with opponents of her ordination. Interviews with James Solheim of the Episcopal Diocese of Massachusetts and Greer Gordon of the Catholic Archdiocese of Boston. Solheim talks about about opposition to Harris's nomination and his support of her nomination. Gordon talks about the reasons for the Roman Catholic Church's opposition to the ordination of women. 1:00:01: Visual: Footage of Reverend Barbara Harris (Episcopal Diocese of Massachusetts) at a press conference. Bishop David Johnson (Episcopal Diocese of Massachusetts) sits next to her. Harris says that she is pleased that the consent process is nearing completion. Shots of the media at the press conference. Marcus Jones reports that it has taken four months for Harris to convince Episcopal Church leaders of her qualifications to be Bishop of the Episcopal Diocese of Massachusetts. V: Footage of Johnson saying that some Episcopal leaders are afraid of women taking over the Episcopal Church. Johnson says that he disagrees with those leaders; that it is important to share the ministry. Footage of Harris saying that her ordination as bishop presents theological and emotional problems for some. Harris talks about the need to seek understanding and reconciliation with opponents of her ordination. Jones reports that the ordination of women into the priesthood has long been controversial among Christian religions. Jones reports that Harris's ordination has been the focus of international attention. V: Footage of the Reverend James Solheim (Episcopal Diocese of Massachusetts) saying that Harris' election has polarized the Episcopal Church. Solheim says that Harris' election to bishop is a first in the history of the Church. Solheim says that some religions leaders do not believe that a woman should stand in apostolic succession. Footage of Greer Gordon (Catholic Archdiocese of Boston) saying that there is no evidence of women having been admitted into the realm of the apostles. Gordon talks about the principle of apostolic succession. Gordon says that the apostles are seen as a direct line from Jesus. Shot of Pope John Paul II. 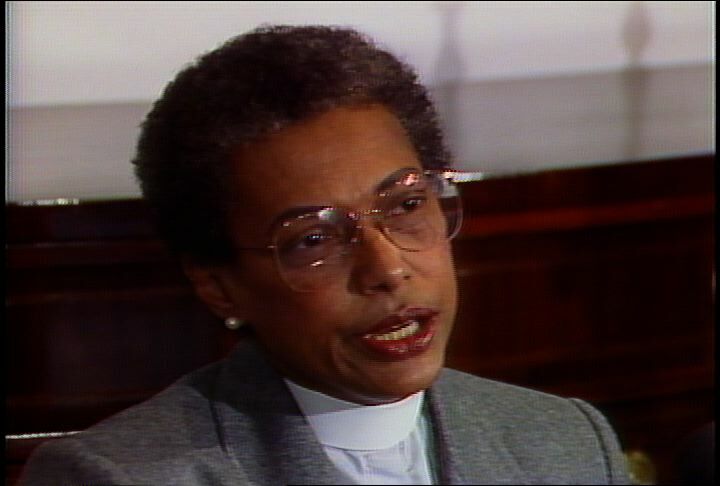 Jones reports that the Episcopal Church was born out of a separation from Roman Catholicism; that the Roman Catholic Church still bans the ordination of women. V: Footage of Gordon being interviewed by Jones. Gordon talks about and quotes from the Scriptures. Gordon talks about the beginnings of the Roman Catholic Church as represented in the Scriptures. Footage of Solheim saying that the Scriptures should not be read "legalistically." Solheim says that there are many laws in the Scriptures which are not followed today. 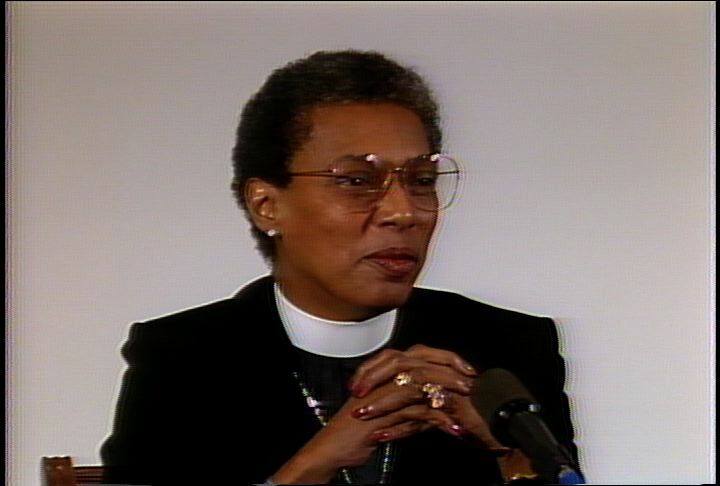 Jones reports that Harris will be installed as bishop on February 11, 1989. Jones notes that it will be a time of celebration for some; that it will be a time of soul-searching for others. 1:00:07: Visual: Shot of the steeple of the Union United Methodist Church at dusk. Shots of the annual Black/Jewish Seder supper at the Union United Methodist Church. Shot of an African American woman and a white man speaking at the supper. A choir sings, "Swing Low, Sweet Chariot." Meg Vaillancourt reports that a group of local African Americans and Jews celebrated the Seder. V: Footage of Leonard Zakim (Anti-Defamation League) being interviewed by Vaillancourt. Zakim says that the supper celebrates the continuing struggle for freedom and civil rights. Footage of Charles Stith (Union United Methodist Church being interviewed. Stith says that society is polarized along racial lines; that the supper is an celebrates efforts to promote peaceful coexistence between groups of people. Stith says that the supper affirms the goals of Martin Luther King Jr. (civil rights leader). Vaillancourt reports that attendees gathered at the Union United Methodist Church) for the eleventh Black/Jewish Seder. V: Shots of attendees reading from a religious text. The attendees hold pieces of matzoh in their hands. Footage of Eric Karp (Temple Ohabei Shalom) being interviewed. Karp says that the Seder celebrates the deliverance of the Jewish people from oppression; that the African American community has fought a long battle against oppression. Karp says that the two communities can learn from one another. Footage of an African American woman being interviewed at the supper. The woman says that she is attending her first Seder; that the two communities are brought together through their belief in God. Footage of an older Jewish woman being interviewed by Vaillancourt. Vaillancourt asks what the two communities have in common. The woman says that the two communities share a lot of things including prejudice and hard times. Footage of an older African American woman being interviewed by Vaillancourt. The woman says that African Americans and Jews are treated the same way. Footage of a young Jewish boy being interviewed. The boy says that "prejudice stinks." Shots of attendees at the supper. Vaillancourt reports that the ceremony is Jewish; that the date is important to those involved in the civil rights struggle. Vaillancourt notes that King gave his last speech twenty-three years ago tonight; that King was murdered in Memphis on the following day. Vaillancourt stands outside of the room where the supper is held. Vaillancourt reports that the Passover meal is symbolic of the exodus from Egypt by the Israelites after 400 years of slavery. V: Footage of Stith being interviewed. Stith says that enslaved African Americans identified with the struggle of Moses and the people of Israel. Stith says that there is a theological kinship between the two communities. Footage from the Seder supper. A choir sings, "Swing Low, Sweet Chariot." Description: Jan von Mehren reports that African American community leaders expressed their rage over the handling of the Carol Stuart murder case. Von Mehren notes that the leaders accused city officials, the Boston Police Department and the news media of racism in handling the case. Von Mehren's report includes angry speeches by Don Muhammad (Muhammad's Mosque), Rev. Graylan Hagler (Church of the United Community), and Bruce Bolling (Boston City Council). Von Mehren notes that the African American leaders have accused police of ignoring obvious clues during their investigation. Von Mehren adds that some leaders called for the resignation of Ray Flynn (Mayor of Boston) and Francis "Mickey" Roache (Commissioner, Boston Police Department). Von Mehren interviews Hagler. Hagler says that police officers ignored community residents who approached them with information about the case. Von Mehren concludes by saying that the African American community suffered a grave injustice in the aftermath of the murder. 1:00:04: Visual: Footage of Bill Owens (State Senator) speaking at a press conference. 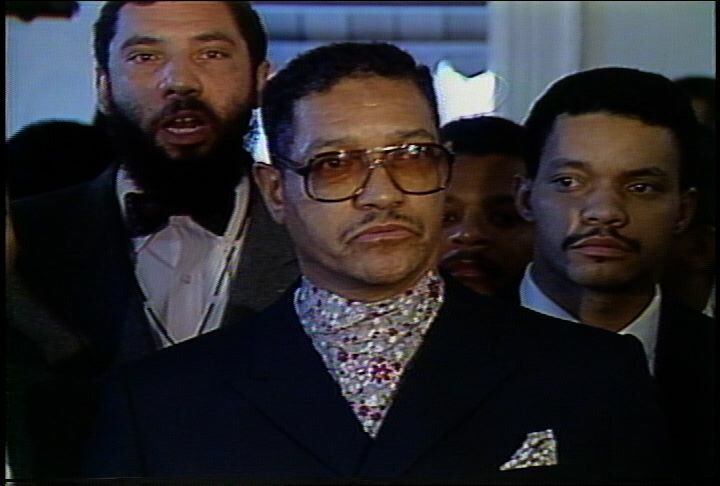 A group of African American community leaders stand behind him. The group includes Graylan Ellis-Hagler (Church of the United Community) and Don Muhammad (Muhammad's Mosque). Owens says that a great injustice has been done to the African-American community. Shots of the attendees at the press conference. Jan von Mehren reports that African American community leaders expressed rage and fury at a press conference today. V: Footage of Ellis-Hagler speaking at the press conference. Ellis-Hagler accuses Ray Flynn (Mayor of Boston) of placing blame too quickly on the African American community. Ellis-Hagler compares Flynn's actions to that of the Ku Klux Klan. The attendees at the press conference give vocal support to Ellis-Hagler's assertions. Footage of Muhammad at the press conference. Muhammad asks if white public officials will call Charles Stuart (murderer of Carol Stuart) "an animal." The crowd cheers. Von Mehren reports that African American leaders believe that Flynn, the Boston Police Department, and the media rushed to conclusions about the Stuart case. Von Mehren notes that the African American leaders say that racism played a huge role in the case. V: Shots of the press conference; of Charles Yancey (Boston City Council) addressing the press conference. Footage of Muhammad at the press conference. Muhammad says that police usually suspect the husband when a woman is killed. Muhammad says that police automatically suspect an African American man when a woman is killed in an African American neighborhood. Von Mehren stands outside of Muhammad's Mosque. Von Mehren reports that African American leaders have accused the police, the mayor, and the media of ignoring vital information about the case. Von Mehren notes that the African American leaders says that the vital information was circulating on the streets of Roxbury on the day after the shooting. V: Footage of Muhammad at the press conference. Muhammad says that there were rumours on the street that Charles Stuart was a drug addict. Muhammad says that police should have investigated those rumours. The crowd cheers. Von Mehren notes that Ellis-Hagler runs a recovery center for drug addicts out of his church in Roxbury. V: Footage of Ellis-Hagler being interviewed by von Mehren. Ellis-Hagler says that the workers in his recovery center told him that Charles Stuart was the murderer on the day after the murder occurred. Ellis-Hagler talks about a man from the community who went to police with information about the murder. Ellis-Hagler says that the man shared information with police which confirmed the alibi of William Bennett (suspect). Ellis-Hagler says that the police told the man that they had a suspect who suited their purposes. Footage of Muhammad at the press conference. Muhammad says that apologies are worthless; that the damage has already been done. Muhammad says that the city has stabbed the African American community in the back. Muhammad says that the African American community has been devastated. Shot of a sign at the press conference. The sign reads, "What does (sic) Boston and South Africa have in common? Stopping and detaining men because of the color of their skin." Von Mehren reports that some African American leaders called for the resignation of Flynn and Francis "Mickey" Roache (Police Commissioner, City of Boston); that some called for restitution to Mission Hill residents. V: Shots of Bruce Bolling (Boston City Council) speaking at the press conference; of attendees at the press conference. Shot of Muhammad at the press conference. Von Mehren adds that the African American community was dealt a grave injustice when police, public officials, and the media were taken in by Charles Stuart's hoax. 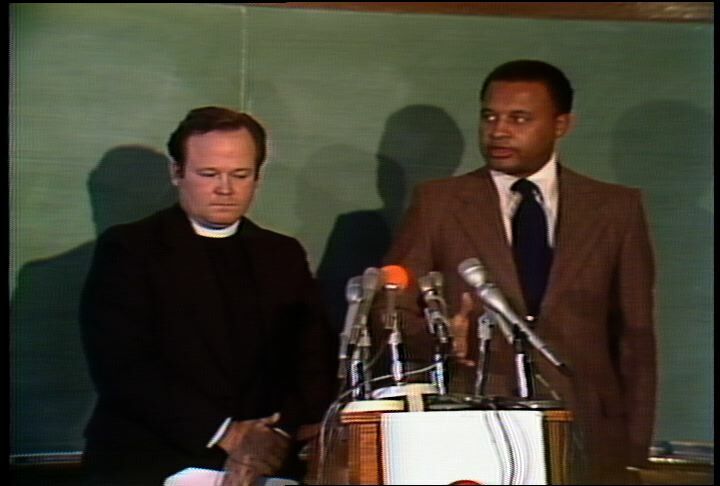 Description: Father Michael Groden (Advisor to Humberto Cardinal Medeiros) introduces a press conference with Cardinal Medeiros (Archbishop of Boston), Bishop Edward Carroll (United Methodist Church) and Donald Luster (President, Ministerial Alliance). Medeiros denounces incidents of violence and hatred and encourages citizens to celebrate the diversity of the urban community. Medeiros says that the clergy has prepared a Covenant of Justice, Equity and Harmony to be signed by the citizens of Boston. Medeiros urges the clergy and every city institution to dedicate itself to working towards peace in the city. Medeiros announces a gathering of religious leaders on the Boston Common on November 19 that will initiate a movement to help the city heal its wounds. Bishop Edward Carroll (United Methodist Church) reads a letter inviting the city's clergy to gather at the Cathedral of the Holy Cross the following Friday. Carroll speaks about the clergy's responsibility to cooperate in promoting peace, justice and harmony in the city; denounces recent acts of violence and hatred; and encourages all citizens to unite. Donald Luster (President, Ministerial Alliance) reads the Covenant of Justice, Equity and Harmony. Groden reviews the series of events planned by the clergy to promote peace in the city. Groden and Luster respond to questions from the media about the movement for peace and the Covenant of Justice, Equity and Harmony. 0:22:45: Visual: Father Michael Groden (Advisor to Cardinal Medeiros) welcomes the press to a press conference. He introduces Humberto Cardinal Medeiros (Archbishop of Boston). Medeiros approaches the podium and addresses the press. Medeiros says that Boston's religious leaders are calling on citizens of all races and religions to examine the Covenant of Justice, Equity and Harmony." Medeiros says that incidents of violence and hatred in the city cannot be tolerated; that citizens must act together to celebrate the diversity of the urban community. Medeiros says that a spirit of religious and pastoral solidarity is growing; that all of the clergy in the city are invited to a meeting on Friday at the Cathedral of the Holy Cross. Shot of the front of the podium. A branch with different colored leaves is pictured on a matted print hanging from the podium. Shots of the press in the audience. Medeiros urges the clergy to join together in an effort to improve the atmosphere in the city. Medeiros says that every institution and business in the city must dedicate itself to working toward a peaceful atmosphere in the city. Medeiros says that the city's religious leader will gather on the Boston Common on November 19; that the clergy will initiate a movement to help the city heal its wounds. Shots of Donald Luster (President, Ministerial Alliance), Bishop Edward Carroll (United Methodist Church) and Groden sitting at a table beside the podium. Medeiros says that the ecumenical movement will encourage citizens to act peacefully toward one another. Medeiros quotes Pope John Paul as saying that a city needs to have a soul; that the citizens are the soul of a city. Medeiros quotes Pope John Paul as saying that Boston has always been a community in which diverse people live and work together peacefully. Medeiros says that every citizen of Boston will be asked to sign the Covenant of Justice, Equity and Harmony; that citizens will be expected to uphold their pledge to work toward a better atmosphere in the city. Medeiros thanks the media and retreats from the podium. 0:29:10: V: Groden introduces Bishop Carroll. Carroll reads a letter inviting the city's clergy to gather at the Cathedral of the Holy Cross on Friday. The letter reads that the clergy must work together to foster an atmosphere of peace, justice and harmony in the city. Shot of the matted print hanging from the podium. The letter mentions a growing spirit of pastoral and religious solidarity. The letter denounces the recent acts of violence and hatred in the city. The letter encourages all citizens to unite in a spirit of solidarity. Shots of Luster, Medeiros and Groden , sitting at the table beside the podium. The letter urges the clergy to participate in the meeting. The letter reads that the clergy have an obligation to encourage its citizens to love one another; that the clergy must join together to renew their Covenant of Justice, Equity and Harmony. Shots of the members of the media at the press conference. The letter is signed by Medeiros and Carroll. 0:31:59: V: Groden introduces Luster. Luster reads the Covenant of Justice, Equity and Harmony. The covenant celebrates freedom and call for the pursuit of equal rights and justice for all. The covenant calls for citizens to celebrate the diversity of the city's communities. The covenant calls for a mood of healing and forgiveness. The covenant denounces conflict and violence. The covenant denounces the atmosphere of hatred and fear in the city. The covenant rejects "special interest groups" which divide the community. Luster finishes reading and sits down at the table beside Medeiros. 0:35:16: V: Groden thanks Luster. Groden reviews the events organized by the city's religious leaders in the coming weeks. Groden mentions the meeting at the Cathedral of the Holy Cross on Friday. Groden says that religious leaders are working on a pastoral letter which will be read at religious services on the weekend of November 17 and 18. Shot of a nun taking a photo. Groden talks about the ecumenical gathering on the Boston Common on November 19. Groden says that civic, political, and religious leaders will be invited to the gathering on the Common; that leaders will be encouraged to examine and sign the covenant; that leaders will be encouraged to take the covenant to their constituents. Shots of the members of the press. Groden says that another ecumenical event will take place in December; that the event will celebrate the signing of the covenant. 0:38:10: V: Groden and Luster respond to questions from the audience. A reporter asks how the leaders will get signatures for the covenant. Luster says that city leaders will sign the covenant on November 19; that these leaders will take the covenant to their constituents, who may sign it. Luster notes that these leaders will be given pins to wear; that the pins will signify peace. A reporter asks which religious leaders will be involved in the movement. Luster says that clergy from all denominations and faiths will gather together on November 19; that business and political leaders will be invited as well. A reporter asks what this series of ecumenical meeting and events will accomplish. Luster says that the events will try to capitalize on the atmosphere of goodwill created by the covenant; that the religious leaders will work to strengthen this atmosphere by preaching the scripture. A reporter asks if these efforts will improve the racially charged atmosphere in the city's schools. Luster says that the religious leaders have a responsibility to set a good example for young people; that the religious leaders need to sound a warning to those who are promoting the negative atmosphere. A reporter asks how the religious leaders will reach out to those who do not attend church. Groden says that religious leaders know that they cannot reach out to all citizens through religious services; that religious leaders will reach out to schools and to the neighborhoods. A reporter asks if the efforts by religious leaders are connected to a recent neighborhood summit. Luster says that their movement has been put together by religious leaders; that religious leaders have a "higher mandate" which propels them to preach the gospel of peace. A reporter asks if the religious leaders expect political leaders to speak out on these issues. Groden says that political leaders have accused religious leaders of not doing enough; that the religious leaders are fulfilling their responsibilities with this movement; that he hopes other leaders will join in. A reporter asks a question about the reference to "special interest groups" in the covenant. Groden says that religious leaders encourage membership in and support of "positive" community groups; that religious leaders are asking people to disassociate themselves from groups whose behavior is not constructive. Groden says that they will not single out any groups. 1:00:00: Visual: Sandra Lynch (former general counsel to the State Department of Education) addresses a Town Meeting on Race and Class at the John F. Kennedy Library. The town meeting is held in honor of the release of the book Common Ground by J. Anthony Lukas (author). Lynch is on a panel with Jack Beatty (Senior Editor, The Atlantic Monthly), Thomas Brown (Professor, University of Massachusetts), Marie Clarke (parent and member of the Home and School Association), Moe Gillen (Charlestown community activist), Father Michael Groden (Archdiocese of Boston), Robert Kiley (former Deputy Mayor of Boston), Theodore Landsmark (attorney), Kim Marshall (Director of Curriculum, Boston Public Schools), Reverend Charles Stith (Union United Methodist Church), and Thomas Winship (former Editor, The Boston Globe). Lynch talks about the irresponsibility of Boston's elected officials, which led to the busing crisis. Lynch says that the Boston School Committee refused to file a school desegregation plans with the federal court in 1974; that the School Committee preferred to do nothing, and then blame someone else for the result. Lynch notes that elected public officials need to uphold the law; that they need to uphold the Constitutional rights of minorities. Lynch talks about the necessity of court intervention when elected officials neglect their duty. The audience applauds. Shots of the audience; of individual audience members. Eric Van Loon (attorney for the plaintiffs, Morgan v. Hennigan) is in the audience. 1:02:01: Visual: Martin Nolan (The Boston Globe) introduces Kim Marshall. Marshall says that Lukas's book is extraordinary; that he has enjoyed reading it. Marshall notes that the Massachusetts Racial Imbalance Law defined a school as imbalanced if the student population was more than 50% African American; that the law did not define an all-white school as imbalanced. Marshall notes that research by Kenneth Clark (social scientist) led the US Supreme Court to rule that all-black schools were "inherently inferior." Marshall notes that the Coleman Report on school desegregation stated that the integration of social class was necessary to "quality education." Marshall quotes Christopher Jencks (author) as saying that schools cannot be improved until poverty is eradicated. Marshall says that the Boston Public Schools now have a majority students who are poor and non-white. Marshall quotes many critics as saying that the Boston Public Schools will not improve until the white and African American middle classes return. Marshall talks about the challenges faced by urban schools with poor students. Shots of audience members. Marshall says that some schools in poor urban areas are succeeding; that these schools share some characteristics: good principals, high standards for all of the students, clear curriculum standards, diagnostic testing, state-of-the-art teaching methods, a safe climate, and an active program which reaches out to parents. Marshall says that Boston schools can be improved using the above model; that Dr. Robert Spillane (former Superintendent of Boston Public Schools) began implementing this model four years ago. Marshall says that Spillane would never have been hired if school desegregation had not taken place. Marshall notes that many of Boston schools are improving under the leadership of new principals. Marshall adds that the school administration and staff does believe that all children can learn. Marshall pledges his support to Dr. Laval Wilson (Superintendent of Schools). The audience applauds. 1:08:55: V: Nolan introduces Reverend Stith. Nolan reports that Stith was recruited by Jesse Jackson (African American leader) to head his new organization, PUSH (People United to Save Humanity); that Stith refused the job because he did not want to leave Boston. Shots of individual audience members. Stith says that there are heroes and villains who emerge in an epic story like Common Ground; that many heroes could have had their own chapters in the book. Stith says that Arthur Garrity (federal judge) needs to be applauded as a hero; that Garrity forced the city of Boston to deal with the issue of race. 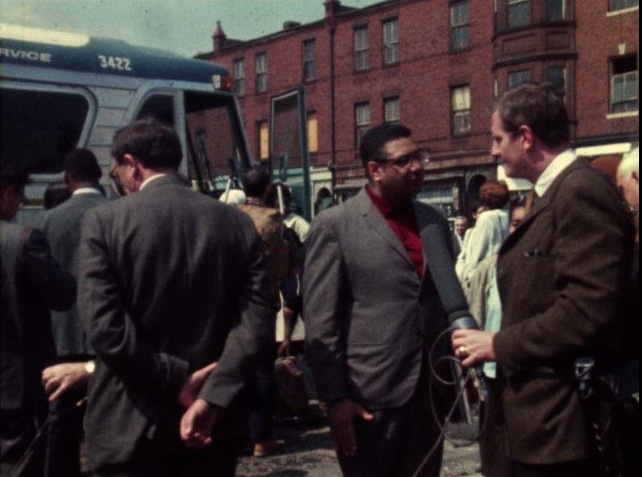 Stith says that Boston's leaders avoided dealing with the issues of race before the busing crisis; that Boston is now a better place for having dealt with race issues through the busing crisis. Stith says that he recognizes the importance of class issues in our society. Stith reminds the audience that class mobility is possible in our society. Stith says that race is the "fundamental problem" facing our society. Stith points out that Common Ground tells the story of three families. Stith says that he would like to return to the point that Elvira Pixie Palladino made about love. Stith talks about the need for teachers to love the students that they teach. Stith says that the students need love in order to learn and thrive; that the love of teachers for their students must be colorblind. The audience applauds. 1:14:49: V: Nolan introduces Thomas Winship. Shots of Paul Parks (former State Secretary of Education); of other audience members. Nolan notes that a chapter of Lukas's book is devoted to Winship. Nolan talks about Winship's courage and commitment to the city of Boston, and his stewardship of The Boston Globe. Winship jokes that he likes Nolan's descriptions of him better than Lukas's descriptions of him. The audience laughs. Winship predicts that Lukas' book will win the Pulitzer Prize for non-fiction. Winship tells Lukas that he enjoyed the book immensely. Winship says that he disagrees with Lukas on a few minor points. Winship says that Lukas did not give enough coverage to John Kerrigan (former member, Boston School Committee). Winship says that Kerrigan was a key figure in the struggle against the court order, "post-Louise Day Hicks." Winship calls Kerrigan the "MVP of the street team." Winship says that he wishes Lukas had covered reactions to busing all over the city; that Lukas' coverage was focused on three neighborhoods. Winship says that he did not like the court-ordered busing plan; that Garrity had no choice in ordering busing as a remedy. Winship says that he has no big regrets about the way his newspaper chose to cover the busing crisis. Winship says that The Boston Globe should have tried to influence the court against the pairing of South Boston and Roxbury in the first phase of school desegregation. Winship says that the pairing of the two neighborhoods was a "dirty trick"; that the pairing placed an "unfair burden" on both neighborhoods. Winship admits that the student population in Boston schools has declined, but he adds that the schools have improved since the busing crisis. Winship notes that test scores are on the rise; that more students are attending college; that schools and athletic teams are integrated. Description: Marcus Jones compares the differing opinions on law enforcement of Deputy Superintendent of Boston Police William Celester and Reverend Graylan Hagler of the Church of the United Community. Interview with Celester, who says that the police are at war with drug addicts and gang members in the neighborhood, and that some of these individuals need to be scared of police. Celester says that police officers are not well equipped to serve as mentors. Jones reports that Hagler and others believe that a new approach is necessary. Hagler recommends that police academy graduates serve as mentors to community youth. Jones' report includes footage of Hagler talking about his plan from December 15, 1989. Hagler and his supporters see prevention as an effective weapon against drugs and violence. Following the edited story is b-roll of Celester and police officers at police headquarters. 1:00:05: Visual: Footage of William Celester (Deputy Superintendent, Boston Police Department) talking to a group of Roxbury residents at Boston Police Department Area B Headquarters on August 21, 1989. Marcus Jones reports that Celester believes that the police officers in his division are at war with drug addicts and gang members in Roxbury, Dorchester, and Mattapan. V: Shot of two plain-clothes police officers arresting an African American man on the street. The man struggles with the police officers. Footage of Celester being interviewed by Jones. Celester says that there is a war over who will run the community. Celester says that either the "thugs" or the residents can run the community. Shot of a white police officer putting handcuffs on an African American man. The man stands beside a red sports car. Shots of police officers standing near a police cruiser with flashing lights. Shots of police officers at police headquarters; of a police officer sitting on a police motorcycle; of two white police officers searching a young African American man. 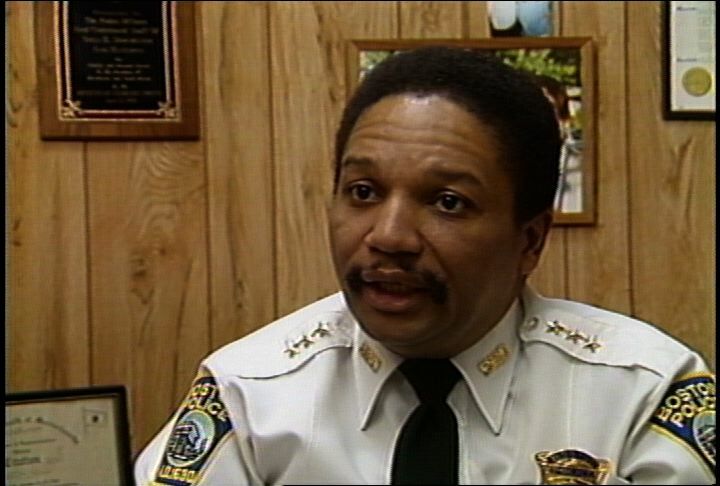 Jones reports that Celester and the officers in his division were criticized last year; that some critics did not think the officers did enough to fight crime. Jones notes that others criticized the officers for going too far; that many opposed the police department's stop-and-search policy. V: Footage of Celester being interviewed by Jones. Celester says that some people need to be scared; that some people only understand fear. 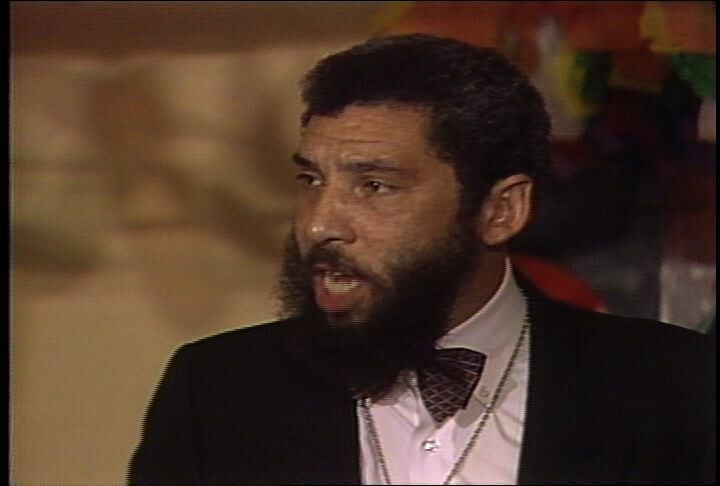 Footage of Graylan Ellis-Hagler (Church of the United Community) from December 15, 1989. Hagler says that police need to find some new tactics because the old tactics do not work. Shots of Ellis-Hagler walking with two African American men toward the Church of the United Community building. Shots of a sign for the Church of the United Community. Shots of Ellis-Hagler talking with a group of African American men at the Church of the United Community. Shots of the individual men in the group. Jones reports that Ellis-Hagler and other community activists are urging the police department to consider ways to prevent young people from getting involved with drugs and gangs. Jones notes that Ellis-Hagler recommends that rookie police officers serve as mentors for the community youth. V: Footage of Ellis-Hagler from December 15, 1989. Hagler says that most police officers are concerned about the community. Hagler says that many police officers are frustrated because they realize that an more innovative approach is necessary. Jones reports that Celester does not think that police officers should serve as social workers. V: Footage of Celester being interviewed by Jones. Celester says that police officers are not well equipped to serve as mentors. Celester says that the police must care about the community; that the police cannot do everything. Shot of an African American man and an African American woman walking past a fire truck in Los Angeles; of police officers arresting a suspect. Jones reports that police officers in Los Angeles and Washington are taking the call for prevention seriously. V: Shot of English High School students walking on a street. Jones notes that the effectiveness of prevention measures cannot be easily measured; that many see prevention as an effective weapon in the war against drugs and violence. V: Shots of a white police officer guiding a group of African Americans away from a crime scene; of medics putting a wounded person on a stretcher into an ambulance. Description: Hope Kelly reports that Barbara Harris (Bishop-elect) has been elected as the first female African American Bishop in the Episcopal Church. She notes that Harris' election to Bishop has divided the members of the Church. Harris held a press conference today. Kelly reports that Harris downplayed issues of race and gender, but that questioners were focused on those topics. David Johnson (Episcopal Church official) is also present. Harris talks about changes in the Episcopal Church and notes that many members are celebrating her election. Harris says that her election is not a "symbol or token." She also answers questions about racism in Boston and in the US. Kelly interviews Reverend Mary Glasspool (Boston rector), Charles Poindexter (Philadelphia rector), and Byron Rushing (State Representative) about the election of Harris to Bishop. All three praise Harris and her qualifications to be Bishop. Following the edited story is additional footage of Harris and Johnson at the press conference. 1:00:18: Visual: Footage of Reverend Barbara C. Harris (Bishop-elect) at a press conference. Harris talks about the changes in the Episcopalian Church. Shots of clergy, press, and others among the audience. Hope Kelly reports that the election of Harris as Bishop has divided the Episcopal Church; that the Episcopal Church has 70 million members across the world. V: Footage of Harris saying that many members of the church are celebrating her election. Kelly reports that the Episcopal Church has ordained women as priests since 1976; that Harris is the first female bishop. V: Shots of Harris at the press conference, sitting next to David Johnson (Episcopal Church official). Shots of the audience. Footage of Harris saying that she was "incredulous" about her election at first. Footage of Harris saying that she has been elected bishop; that she is not "a symbol or a token." Shots of the audience. Kelly reports that Harris downplayed her gender and skin color; that questions kept returning to those topics. V: Footage of Harris saying that race has always played a role in all areas in the US. Harris says that her race will not make her job more difficult. Shots of the media at the press conference. Kelly reports that Harris answered quesions patiently; that she did not reveal many of her personal feelings. V: Footage of Reverend Mary Glasspool (Boston rector) saying that Harris is a loving person with a great sense of humor. Footage of Charles Poindexter (Philadelphia rector) saying that Harris is outgoing and vivacious. Footage of Byron Rushing (State Representative) being interviewed by Kelly. Rushing says that Harris is brilliant; that Harris is concerned about the needy. Kelly notes that Rushing has known Harris since the 1960s; that both were active in the civil rights movement and the Episcopal Church. V: Footage of Rushing telling a joke about African American Episcopalians. Rushing says that African American Episcopalians have a long history in the US. Kelly reports that Harris is fifty-eight years old; that Harris is divorced with no children. Kelly notes that Harris has been a priest for eight years; that she was in public relations for thirty years before becoming a priest. V: Footage of Harris saying that she does not know if Boston is any more racist than other cities; that she has dealt with racism for her whole life. Footage of Glasspool saying that Harris's election gives her great hope for the future of the Episcopal Church. Description: Hope Kelly reports that Reverend Graylan Hagler of the Church of the United Community has announced his candidacy for mayor of Boston. He says that it is time for a change in the city of Boston. His supporters cheer. Kelly reviews Hagler's credentials and career. She notes that Hagler has a confrontational style and is experienced in the art of political theater. Kelly reviews Hagler's recent political activities. Kelly's report includes footage of Hagler addressing striking hotel and restaurant workers in November of 1988 and footage of Hagler with unemployed construction workers at a press conference at a Roxbury construction site in December of 1990. Kelly's report also includes footage of Hagler denouncing racism on the part of city officials at a press conference in the wake of the Carol Stuart murder case. Kelly's report includes footage from an interview with Hagler in March of 1991. He says that he is seeking justice and equity in the city. 1:00:11: Visual: Footage of the Reverend Graylan Ellis-Hagler (Church of the United Community) announcing his candidacy for mayor of Boston. Ellis-Hagler says that it is time for change. The audience applauds. Shots of Ellis-Hagler supporters cheering. Hope Kelly reports that Ellis-Hagler's announcement was a rousing reminder that many residents of the city are ready for a change. V: Footage of Ellis-Hagler speaking to supporters. Ellis-Hagler says, "no more business as usual" and "no more disrespect." Kelly reports that Ellis-Hagler is a minister; that Ellis-Hagler was born in Baltimore and graduated from Oberlin College. Kelly reports that Ellis-Hagler listed many reasons why Ray Flynn (Mayor of Boston) should not be re-elected. V: Shots of Ellis-Hagler as he addresses the crowd. Shots of the audience. Footage of Ellis-Hagler addressing supporters. Ellis-Hagler says that streets in some neighborhoods have more trash-filled lots than houses. Ellis-Hagler says that the city is ready for a change. The audience applauds. Kelly reports that Ellis-Hagler says that his constituents are the ones who live on streets with vacant lots. Kelly reports that Ellis-Hagler believes that the city needs to hire more of its own residents instead of bringing in workers from outside. V: Footage of Ellis-Hagler addressing supporters. Ellis-Hagler says that many workers in the city come from towns outside of the city. Ellis-Hagler says that the city is ready for change. The audience applauds. Shot of Chuck Turner (teacher) holding up Ellis-Hagler's arm as he sits down after his speech. Kelly reports that Ellis-Hagler is experienced in the art of political theater; that Ellis-Hagler does not give in or give up quickly. V: Footage of Ellis-Hagler speaking to striking hotel and restaurant workers in November of 1988. Ellis-Hagler embraces Domenic Bozzotto (union leader). 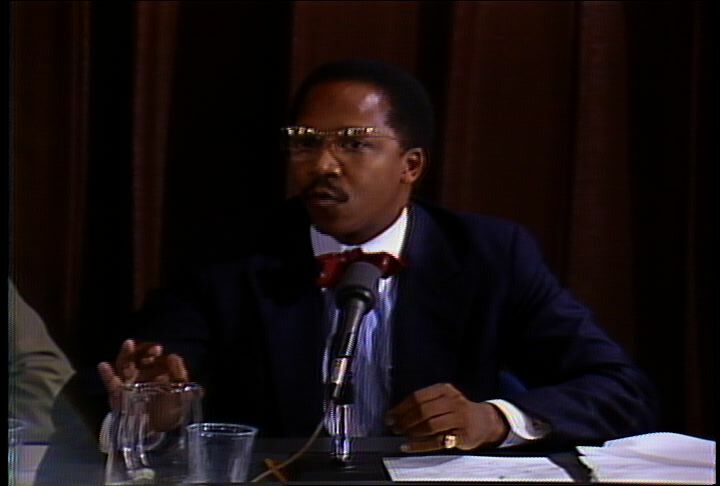 Footage of Ellis-Hagler at a press conference at a construction site in Dudley Square in December of 1990. Unemployed African-American construction workers stand behind him. Ellis-Hagler says that the workers will not "go away with crumbs." Shots of the construction site. Kelly reports that Ellis-Hagler was arrested twice last winter at the construction site of a new Post Office facility in Dudley Square. Kelly reports that Ellis-Hagler was supporting the cause of unemployed construction workers in his community. V: Footage of Ellis-Hagler being interviewed on March 13, 1991. Ellis-Hagler says that people must buck the system in order to stand up for their dignity and rights. Footage of Ellis-Hagler at a press conference about the Carol Stuart murder case in January of 1990. Ellis-Hagler compares the actions of city officials and the media to the actions of the Ku Klux Klan. Ellis-Hagler says that the African American and Latino communities have been "raped" by the police and the media. Shot of an audience member at the press conference holding a sign reading, "What do Boston and South Africa have in common? Stopping and detaining men because of the color of their skin." 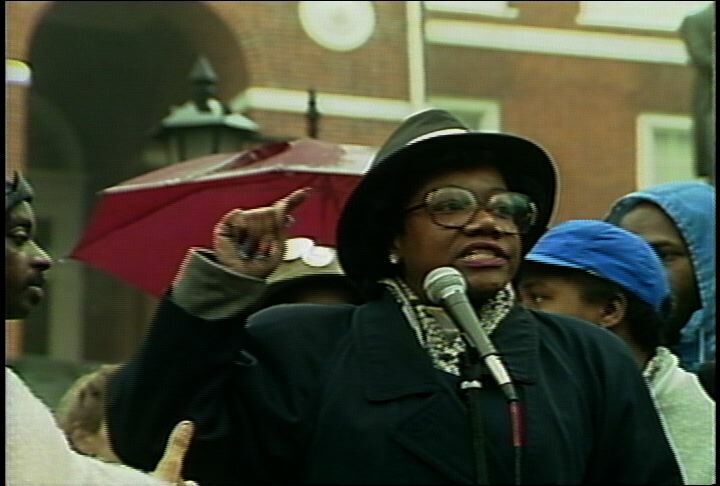 Kelly reports that Ellis-Hagler excoriated the police, the media, and the mayor after the murder of Carol Stuart (Reading resident). Kelly notes that Ellis-Hagler's style is confrontational. V: Footage of Ellis-Hagler being interviewed on March 13, 1991. Ellis-Hagler says that he has a desire to seek justice and equity in the city. Ellis-Hagler says that he wants the voices of all of the people to be heard. Kelly stands outside of a church. Kelly reports that Flynn' s campaign is following the actions of Ellis-Hagler; that Ellis-Hagler is short on money, but long on mission. V: Footage of Ellis-Hagler addressing his supporters. Ellis-Hagler says that he and his supporters will win. The audience applauds. Ellis-Hagler steps back from the microphone and greets Elizabeth Ellis-Hagler (wife of Graylan Ellis-Hagler). Another man speaks into the microphone.